﻿ Do you know where the fiber media converters are used? 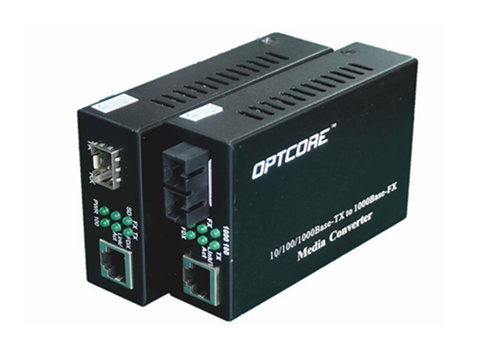 Fiber media converter is an Ethernet transmission media conversion unit that converts short distance twisted-pair electrical signals and long-distance optical signals and is also called Ethernet media converter. It is generally used in Ethernet networks that the network cable can not be covered, must use optical fiber to extend the transmission distance of the actual network environment, and usually located in the broadband metropolitan area Network access layer application. In the traditional Ethernet, the main medium of connecting is twisted pair. The limit of transmission distance of twisted pair is about 200 meters, so the short transmission distance restricts the development of the network, and the influence of the twisted pair on the electromagnetic interference is great, which makes the data communication quality greatly affected. By use of fiber media converter, change the Ethernet connection medium to fiber cable. The optical fiber has the feature of low loss, high resistance to electromagnetic interference, making it covers network transmission distance from 200 meters to 2 kilometers or even dozens of kilometers, or hundreds of kilometers at the same time, which make the data communication quality has been greatly improved. It makes the interconnection between servers, repeaters, hubs, terminals, and terminals more straightforward. The backbone network is constructed by using the SPANNINGTREE characteristic to construct the backbone of the metro area. This structure can be deformed into a mesh structure, which is suitable for the high-density central area of the metropolitan area network, forming a fault-tolerant core backbone network. Ring backbone network support for IEEE.1Q and ISL network features can guarantee compatibility with most mainstream backbone networks, such as cross-switch VLAN, TRUNK, and other functions. Ring backbone network for the financial, government, education and other industries set up broadband virtual private network. The chain-type backbone network can save a large number of backbone fiber cable by chain connection, which is suitable for constructing high-bandwidth and low-cost backbone network at the edge of the city and the suburbs. The model can also be used for highway, oil and transmission Lines and other environments. Chain backbone network support for IEEE802.1Q and ISL network features can guarantee compatible with the vast majority of the backbone network, for the financial, government, education and other industries set up broadband virtual private network. The chain backbone network is able to provide image, voice, data and real-time monitoring of integrated transmission of multimedia networks. User access system using 10Mbps / 100Mbps adaptive and 10Mbps / 100Mbps automatic conversion function, you can connect any client device, without the need to prepare a variety of fiber-optic transceivers, the network can provide a smooth upgrade program. At the same time the use of half-duplex / full-duplex adaptive and half-duplex / full-duplex automatic conversion function, you can configure the user inexpensive half-duplex HUB, reduce the cost of the client network for dozens of times, improve the competitiveness of Internet operators. At the same time, the device’s built-in switching core improves the transmission efficiency of the access equipment, reduces the network broadcast, the control flow, the detection transmission fault.